Armaan Malik (born 22 July 1995) is an Indian playback singer and actor. A finalist on Zee Tv's Sa Re Ga Ma Pa L'il Champs, Armaan advanced to eighth place with public votes. He is the brother of composer Amaal Mallik. previously represented by Universal Music India, and now signed on by T-Series. His first on-screen appearance was in the film Kaccha Limboo in the year 2011. Malik has dubbed for My Name Is Khan for the English boy and also lent his voice for the character Salim in the radio version of Slumdog Millionaire for BBC Radio 1. In 2014, Armaan sang ‘Tumko Toh Aana Hi Tha’, ‘Love You Till The End (House Mix) and the ‘Title Track’ for Salman Khan's movie Jai Ho. Apart from singing, Malik and his music composer brother Amaal Mallik also featured in the beginning of Jai Ho in the song ‘Love You Till The End'. In that year, he sang 'Naina' with Sona Mohapatra for the film Khoobsurat and 'Auliya' for Ungli. Malik has dubbed for My Name Is Khan for the English boy and also lent his voice for the character Salim in the radio version of Slumdog Millionaire for BBC Radio 1. In 2014, Armaan sang ‘Tumko Toh Aana Hi Tha’, ‘Love You Till The End (House Mix) and the ‘Title Track’ for Salman Khan's movie Jai Ho. Apart from singing, Malik and his music composer brother Amaal Mallik also featured in the beginning of Jai Ho in the song ‘Love You Till The End'. In that year, he sang 'Naina' with Sona Mohapatra for the film Khoobsurat and 'Auliya' for Ungli. In 2015, he sang 'Main Hoon Hero Tera' for Hero, 'Kwahishein' for Calendar Girls & 'Tumhe Aapna Banane Ka' for Hate Story 3 under elder brother Amaal mallik's composition. The latter one he sang with Neeti Mohan. He also sang another song for Hate Story 3 titled 'Wajah Tum Ho' under Baman's composition. He also sang a single Main Rahoon Ya Na Rahoon under Amaal's composition. He was awarded Filmfare R. D. Burman Award for New Music Talent in that year. In 2016, he sang for the films like Mastizaade, Sanam Re, Kapoor & Sons, Azhar, Do Lafzon Ki Kahani & 'Sab Tera' with Shraddha Kapoor for Baaghi under Amaal's composition. He sang 'Foolishq' with Shreya Ghoshal for Ki & Ka, he worked with Jeet Gannguli for a song titled 'Mujhko Barsaat Bana Lo' for Junooniyat & also sang his first Bengali song 'Dhitang Dhitang' for Love Express under Jeet's composition. He was the lead singer of the film M.S. Dhoni: The Untold Story. He sang four songs for Hindi soundtrack and three songs for Tamil soundtrack of that film under Amaal's composition. He sang 'Sau Asmaan' with Neeti Mohan for Baar Baar Dekho & 'Ishaara' for Force 2 under Amaal's composition. He sang 'Tum Jo Mille' for Saansein, 'Pal Pal Dil Ke Paas Reprise ' & 'Dil Mein Chupa Lunga Remake' for Wajah Tum Ho. The latter one was composed by Meet Bros and the last two songs, he sang with Tulsi Kumar. He sang a single 'Pyaar Manga Hain Remake' with Neeti Mohan. He also lent his voice for the title track of Star Paarivar Awards 2016 with Palak Muchhal & Meet Bros under Meet Bros composition. In 2017, he sang two singles 'Aa Jana Ferrari Mein' & 'Paas Aao Na' under Amaal's composition. He also sang a single 'Kehta Yeh Pal Pal Remake'. He worked with Gourav-Roshin for 'Haare Ram Remake' and Mannan Shah for 'Tere Dil Mein'. Both the songs were made for the film Commando 2. He sang for Noor, Chef & Golmaal Again under Amaal's composition. He sang two songs for Sweetiee Weds NRI, 'Shiddhat' & 'O Saathi'. He worked with Arko Pravo Mukherjee first time for the latter one. He sang two Bengali songs in 2017. One is the title track of Ami Je Ke Tomar & 'Ele Chupi Chupi' for Amar Aponjon. He also sang for Mubarakan, Tera Intezaar & Tumhari Sulu. In 2018, he sang a single "Ghar Se Nikalte Hi" under Amaal's composition. He worked with Tanishk Bagchi first time for the title track of Dil Juunglee. He also sang 'Baadnamiyaan' for Hate Story 4 under Baman's composition(originally composed by luvdeep saini). He also sang for films like Nirdosh, October, 102 Not Out. He sang for the films like Baazaar & Sanju. However, the songs are dropped from the album due to some changes in script. He lent his voice for the Hindi soundtrack of 2.0 which is the most expensive Indian film made to date. The soundtrack of the film was composed by A. R. Rahman and the film was released in the year 2018. In 2019, He sang a song in De De Pyaar De composed by Amaal and lyrics by Kunaal Verma. He also lent his voice for the movie Amavas, "Jab Se mera Dil" with Palak Muchhal for the movie Amavas,"Dil Me Ho Tum" for the movie Why Cheat India,"kyun rabba" for the movie badla.The singer is currently featured as a coach on an Indian reality show The voice. "Tere Dil Mein (Club Mix)"
↑ "I learnt dance because of Salman Khan: Armaan Malik". 30 December 2016. ↑ "Armaan Malik creates a record". 28 September 2016. ↑ "Armaan Malik: Latest News, Videos and Armaan Malik Photos - Times of India". The Times of India. ↑ "Yuva Dasara: Young Singer Armaan Malik Drowns Crowd In Soulful Melodies Amidst Rain". Star of Mysore. October 15, 2018. ↑ "Jai Ho music review". Glamsham.com. Retrieved 31 December 2013. ↑ "Young hitmaker Armaan Malik on his first public concert in Bengaluru". Times of India. October 2, 2018. ↑ "Armaan Malik honoured with Dadasaheb Phalke Film Foundation Award". Indian Express (25 April 2016). Retrieved 21 July 2018. 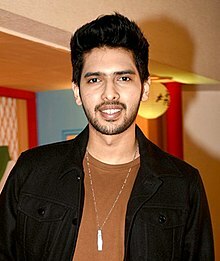 Wikimedia Commons has media related to Armaan Malik.